Should you floss your teeth? Landale Dental Makes Box Hill’s Local News! The team at Landale Dental have joined Starlight’s Sugar Free Me Challenge to raise funds to bring a dose of happiness to sick kids and encourage healthy eating habits in the community. Please donate to our page to help us reach our fundraising goal. Landale Dental will also match the goal towards Starlight Children’s Foundation! Landale Dental’s Dental Therapist teaches kindergartners all about keeping their smiles healthy! Debra Harper gives another valuable educational visit to a local kindergarten! Deb makes learning fun for children, showing them how to keep their smiles clean and their teeth healthy with interactive learning about hygiene & diet as well as providing with learning aides and hygiene tools to get them started. The kids loved with great feedback from the staff and children. Part of Landale Dental’s mission to provide education and service to the community to prevent dental problems. Landale Dental in Box Hill will be closed over the Easter long weekend from Friday 19th April to Monday 22nd April 2019. Landale Dental in Box Hill will return to normal business hours on Tuesday 23rd April 2019. For emergency dental care, please call The Royal Dental Hospital of Melbourne on (03) 9341 1000. For non-urgent matters please visit our website, facebook message, email or call to leave a voicemail for us. Wishing you all a safe and happy Easter from the team at Landale Dental in Box Hill! Landale Dental in Box Hill are excited to celebrate World Oral Health Day on March 20th 2018! This year, the annual event run by the FDI: World Dental Federation is focusing on the notion of the mouth serving as a window to the body and reflecting overall general health. Healthy mouth = Healthy body. No matter what stage of life you are in, healthy teeth and gums are one of the prerequisites to having a healthy body and maintaining a quality of life. Your dentist is one of the most important people in assessing your teeth, gums and mouth to help detect and prevent any serious diseases. Sun damage to the lips, smoking, alcohol and other factors can increase the risk of mouth cancer – our dentists are in a prime position to perform cancer checks of your entire mouth. There is strong evidence that proves gum disease is a risk factor for diabetes and heart disease. Early detection and management of gum disease by your dentist can therefore improve your overall health and reduce complications associated with heart disease and diabetes. Did you know our dentists can also screen and assist in the diagnosis and treatment of jaw pain and sleep apnoea, which is a high risk disease affecting the population? The mouth acts as a window to screen for other diseases; and early detection and management can be life changing. Too often young children present with advanced tooth decay and the subsequent tooth abscess, swelling and fever opens the door to further health implications which can only be managed under a hospital setting. Tooth decay is preventable with a healthy diet, good oral hygiene and regular visits to the dentist once your child’s first tooth appears. Practicing good oral hygiene and maintaining visits with your dentist to receive personalized information, can contribute to a lifetime of improved well-being. It is never too early or too late to start looking after your mouth. Your body will thank you for it! Landale Dental in Box Hill are active members of the Australian Dental Association and have serviced the area for 18 years. Landale Dental in Box Hill is excited to be promoting this great oral health initiative with our patients and the wider community. Landale Dental in Box Hill is proud to announce it has been recognised for our exceptionally high standards as an Accredited Dental Practice in Australia. Special thanks to our hard working team of clinicians, support staff and our practice administrator for their hard work. We have been accredited to the National Safety and Quality Health Service Standards! Come visit our newly renovated second treatment room! Landale Dental in Box Hill is also pleased to now offer nitrous oxide (“happy gas”) or relative analgesia for anxious patients and children if required. Call us on 98990148 to speak to our friendly staff about this. 1. Brush your teeth with the right technique (circular motions angled towards the gums), the right brush (a soft bristle brush, consider a powered brush) and the right pressure (gentle soft) for you, the right frequency (twice a day, morning and before you sleep) and right duration (2 minutes, in front of a mirror so you clean every tooth, every surface). Use a fluoridated toothpaste, speak to your dentist about the right brush that suits your dexterity and teeth and the right toothpaste for your risk category. 2. Floss daily to clean between your teeth where your toothbrush won’t reach. Speak to your dentist about the right type of floss or device to get between your teeth. Avoid abrasive toothpicks. Rinsing or water-sprays aren’t the same as wiping the disease-causing-film that develops on teeth. 3. Have a healthy diet, including drinking lots of Aussie tap water, limit snacks especially acidic and refined surgary foods, & chew sugar-free gum after meals. Mouthguards help prevent dental injury in not only contact sport such as karate,football, rugby and hockey, but also non contact sport such as cricket, netball, soccer, skateboarding or basketball as they all carry risks of collision and trauma. Mouthguards are made to reduce the risk of serious injury such as broken jaws, broken teeth or knocking teeth out completely. Such dental injuries are difficult to treat and can lead to a lifetime of dental expenses, but are easily preventable with custom made mouth guards. Mouthguards work by absorbing and evenly spread the forces of the trauma. The mass produced “boil and bite” mouth guards which are purchased over the counter do not fulfil the above requirements and therefore, are negligible in providing protection against dental injury. Mouthguards are made with your dentist who will take moulds of your teeth which can then be used to fabricate these high quality, custom made mouthguards. Contact us Landale Dental in Box Hill to enquire. Great to see Channel 7 television news this evening report on the achievement of the Australian Dental Association in its advocacy for the health of children. Landale Dental dentists are proud members of the ADA and support better health for the children of our community. We bulk-bill on the spot for all eligible children on the Medicare Child Benefits Dental Scheme (CDBS). Should you floss your teeth? Yes!… You may have heard recent online posts or articles saying you may not need to. But, don’t give up based on those just yet. Well, although there isn’t a large body of academic studies on flossing yet, there is enough basic science and clinical practice evidence (and common sense) behind cleaning between your teeth to prevent decay and gum disease. It’s hard to do a long term study because you have to follow a large number of people over a long enough period of time. Then you have to ensure that the group that flosses is flossing properly & frequently enough. Also for comparisons, how could you ethically ask a control group not to floss? Flossing basically wipes away the film of bacteria that develops during the day before you get bad bacteria causing either gum disease or dental decay. Flossing is low cost, has a low risk of causing damage and should be part of our daily hygiene routine. Landale Dental in Box Hill made a special appearance in the Whitehorse Leader newspaper in recognition for their promotion of Dental Health Week. We are very proud of the whole team for their contribution in spreading awareness about Dental Health Week in the local community! Dental Health Week (August 1-7) is fast approaching! As Australian Dental Association members, Landale Dental in Box Hill are happy to be promoting this great initiative. This years theme is “Women and Oral Health”, which focusses on how women can take charge of their oral health through every part of their life. Stay tuned for updates and resources that you and your loved ones will benefit from or visit us at Landale Dental in Box Hill for an oral health consultation. The team at Landale Dental in Box Hill are very proud of our Dental Therapist, Debra Harper! Debra has been a part of the Landale Dental team for over ten years now and has been a regular volunteer for numerous oral health projects in third world communities. This year, Debra is heading off to the Phillipines with a team of healthcare professionals (doctors, dentists, dental/oral health therapists, optometrists) to provide medical attention to those who cannot access the health care they require. Click the link below for more information and help support Debra on this very worthy cause! 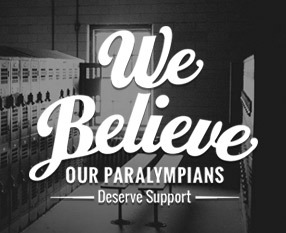 Landale Dental “Believe in our Paralympians” and was proud to support the Australian Paralympic Committee in their campaign as a donator this year.